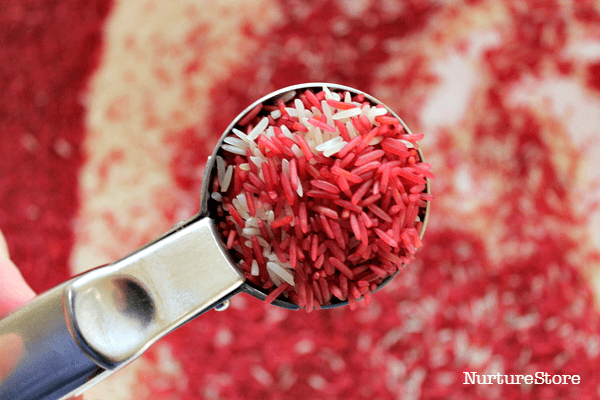 I like using rice as the base for sensory tubs because it lasts for ages, so we can use one bag time and time again for lots of play. It takes colour and scent well, and has a lovely texture that my children love. 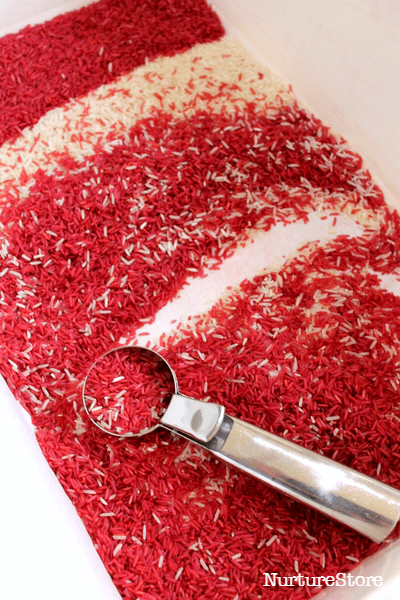 I used my simple way to dye rice, placing uncooked rice in a plastic bag with a couple of drops of red food colouring and a drop or two of peppermint extract, for the candy cane scent. 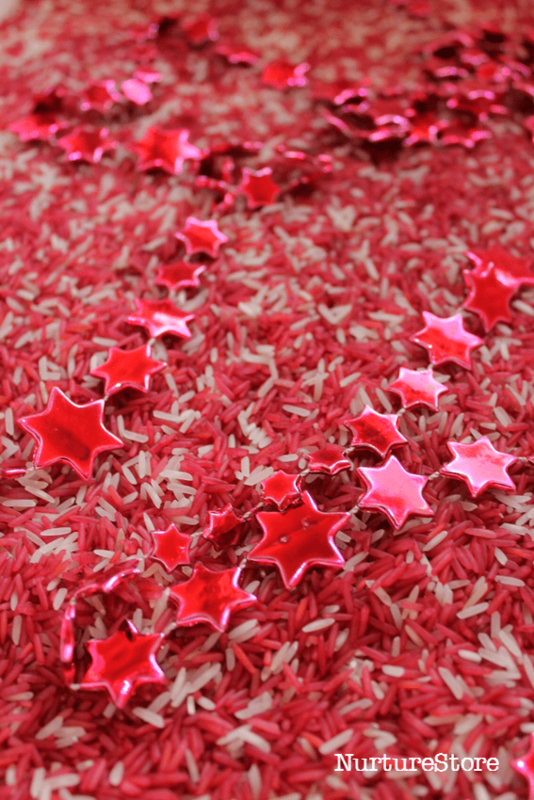 Fasten the bag and let the children give it a really good shake until all the rice is coated in colour. Then lay it out on a tray overnight to dry out. I often use an under-the-bed storage box as our sensory tub, as it’s just the right size for a couple of children to play together. 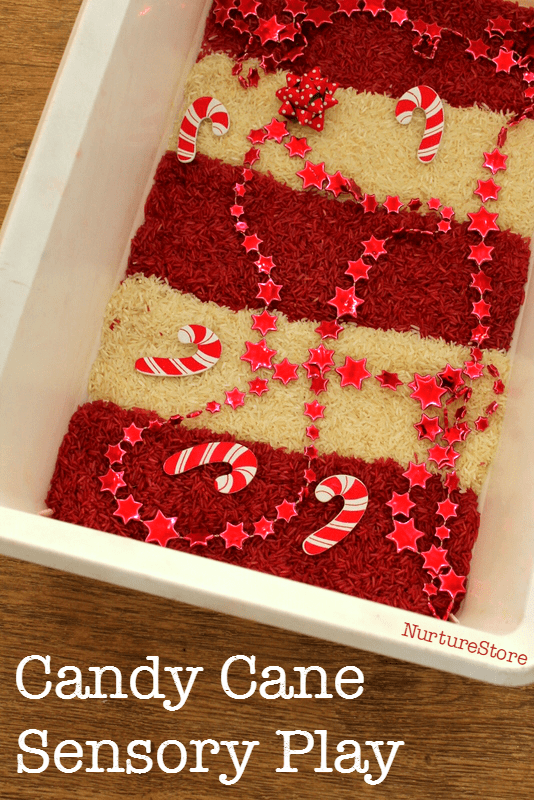 Along with the dyed rice I used plain white rice too, to make some candy cane stripes – they didn’t last long! 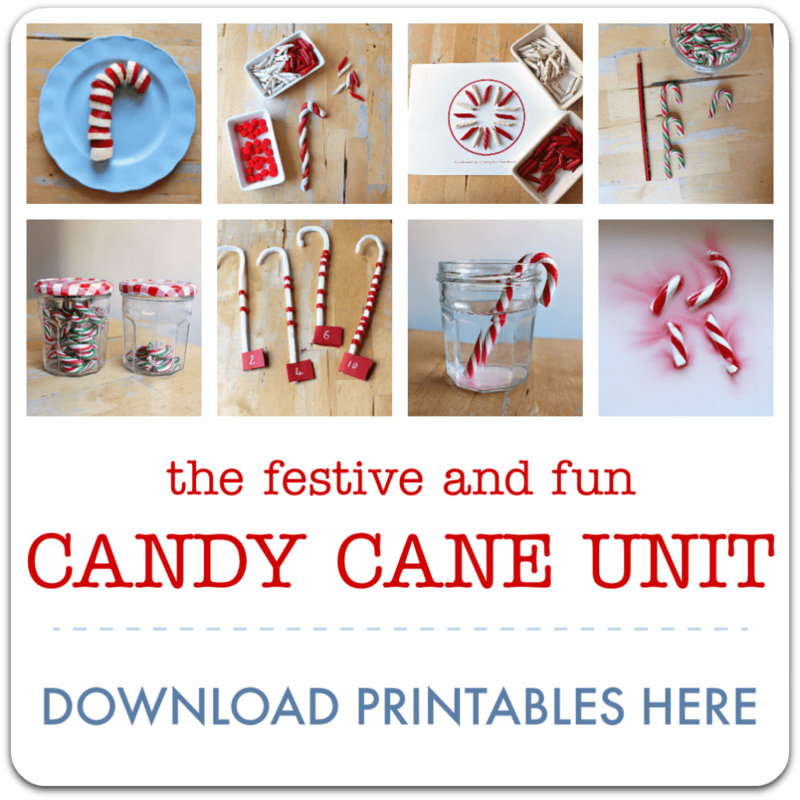 You can add in a few Christmas decorations (make sure they are safe for your children to play with) so the children can dig in and go treasure hunting. Let your children play! 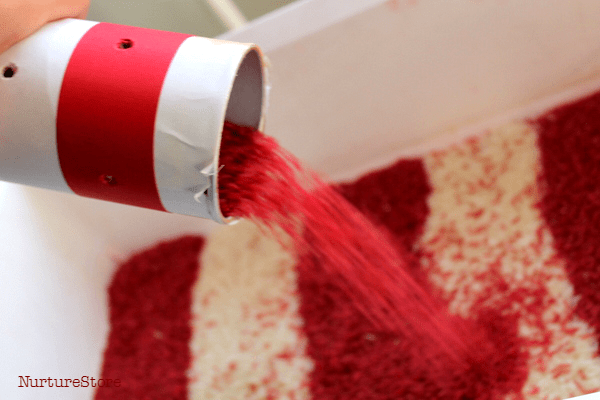 A sensory tub is a wonderful open-ended play set-up that invites children to uses their senses to explore the materials. Sit alongside and listen to them as they play and you might hear all sorts of ideas spring up: they might use the tub to role play, tell stories, talk about how the materials feel. 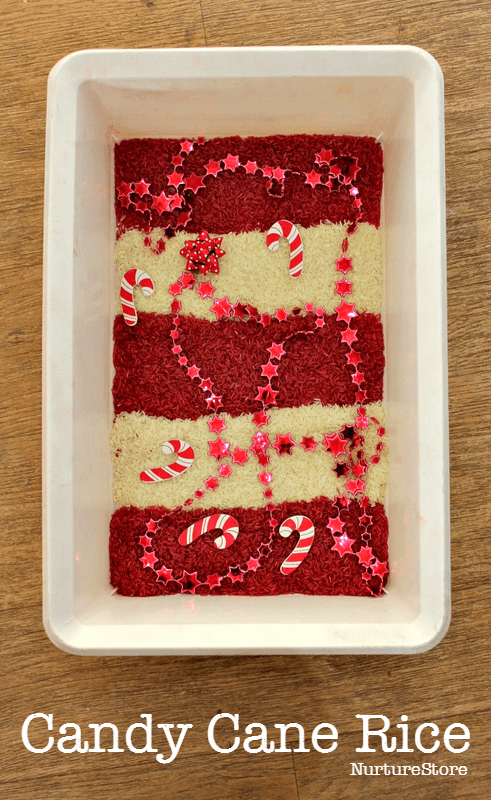 You could count all the candy canes or play I-spy. 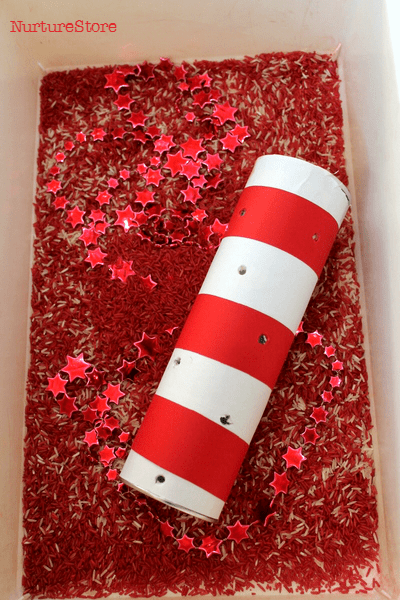 I turned a big cardboard tube into a scoop-and-pour tool by wrapping the outside in some candy cane stripes and making some holes in the sides with the point of a pencil, so the children could scoop up the rice and shake it out through all the holes. It’s was great for pouring too – and every scoop and pour released more of the peppermint scent. Lovely! An ice-cream scoop is another great addition. You can use it to make patterns or write. The tub is a lovely sensory combination of sight, touch, sound and of course smell. 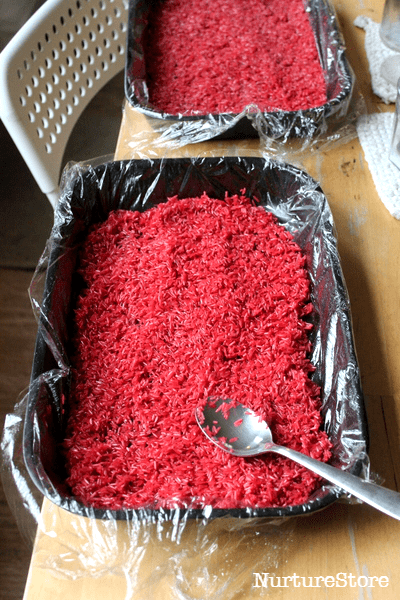 If you cover it with a lid, or seal it all back up in a plastic bag, it will last right through the holiday season and it to next year, for lots of soothing sensory play. oooh I want to dig my hands right in to this!!! Looks so inviting!